The Amazon-Basics 6-Sheet Cross-Cut Paper and Credit Card Shredder has the capacity to shred up to 6 sheets at a time. It can easily cut papers, staple wires, and paper clips so there’s no need to remove staples and clips before shredding. It can also handle cutting credit cards one at a time. The shredded pieces are cut into 7/32 by 1-27/32 inches. It comes with features like Auto start and manual reverse for instances of paper jamming. It has an 8.7 inch wide paper feed slot, a 3.8 gallon bin, and thermal protection with auto shut-off. The AmazonBasics 6-Sheet Cross-Cut Paper and Credit Card Shredder measures 15 x 12.1 x 7.7 inches and comes with an industry standard of 1 year limited warranty from AmazonBasics. This is one reliable product. I have tried other shredders in the past and I can say that it beats other shredders of its type. This model is able to deliver what it promises and does not disappoint. As soon as removing the device from the box, I tested it with 6 sheets of 20-lb weight paper at a time and it worked with no problems. As expected, the shredder slows down a little if you put in more than its 6 sheet capacity. When I did so, I found that most of the times it will continue to shred but there were also times when it just jammed. If you want to shred faster in this model, you can do so by feeding only 3 papers at a time. I tested it with papers with paperclips and staples on and it delivered just as promised as well. I then tested it with credit cards and it cut the cards pretty neatly. I had the impression that this model can perform well even when operating at more than its usual capacity but I wouldn’t really advise doing so. It’s already a great deal for your general purpose cross-cut shredder. This model of cross-cut paper shredder is able to shred pieces diagonally and into small pieces typical of its type. This gives me the security and peace of mind whenever I use the device in shredding my ATM receipts, financial bills, and other personal documents with sensitive info. I have also checked the shredded pieces to make sure that they cannot be reconstructed; in my opinion, the strips are cut too small to make them even readable. I’d be really surprised if anyone would be able to do anything with them. Its capacity for shredding 6 sheets at a time makes the model ideal for home, personal, or light use. This makes it the best choice when you need to consider security, convenience, and budget altogether. Shredded pieces from cross-cut shredders are normally easy to dispose of. This is owing to the fact that the strips are smaller and are consequently compressed together. This is definitely an advantage over strip-cut shredders. It’s also important to take note that this model is designed with a small body. That means it can only contain as much as a small capacity waste bucket. As a workaround, you can just easily line the interior with a plastic bag to help collect all the waste. You can also take advantage of the Reverse switch feature that comes with this model, which will enable you to unclog waste material should you exceed the shredding capacity. I think that the basic design of the shredder head and waste bucket is practical and more than adequate for its purposes. Safety measures are something that I automatically scan for when choosing a paper shredder. The main safety measure found in this model is the Safety switch. The switch can be found on the back of the shredder’s body. 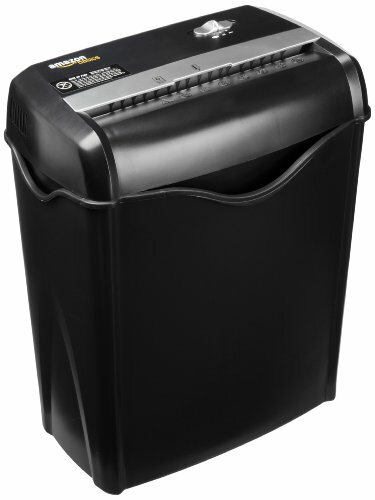 It secures the shredder to only perform while it is in a supplied can. This protects your fingers from getting chopped when cleaning the shredder teeth in case you intentionally or unintentionally left the shredder plugged in and powered. Another great thing about this model is that it offers thermal protection against overheating. This makes it durable and a good investment for your shredder. It would be nicer if you could do some shredding in peace – without noise. You can just wait for the shredding to be through as you listen to an audio or music or watch TV. Unfortunately, this model shreds at 70 dB. It is noisy as it shreds, noisier than your regular strip-cut shredders. But this is typical of cross-cut shredders so don’t expect ultra-quiet performance such as you’ll find in other types of shredders. The noise of this unit is the only negative factor I found with this model overall. This makes it a great value for the money.